Round 2 of the annual Pittsburgh Chess Club Championship had me playing a tough and very long game, the second to last game to finish (which it did after four hours). There was time trouble for both me and my opponent near the end of the game, but I managed to win. So I thought I would touch on the issue of time trouble in chess. As mentioned in my report on round 1, after which I knew who my opponent was supposed to be for round 2, Melih Ozbek, I had nothing to prepare for this round. I had only played him once before, as White, not as Black. I thought for a long time but could not find a win (and there isn’t one). I then realized I had to play something, and that clearly I was getting tired because I could not think as well as I could hours earlier at the beginning of the game. I could not afford to get into time trouble later in the game when I expected more important positions to potentially arise. I started playing “safely”, with the idea of waiting for my opponent to make worse moves than mine. We reached this position, in which there was a beautiful forced win that I completely missed. If I had found it, I would be submitting my game for the “Best Attack” special prize for the tournament! The winning move is Ra2!! sacrificing a Rook to deflect White from King defense. If White takes the Rook, then Black invades with Qg3. It turns out that White could have simply played Nf3 and held everything, but he didn’t, and so the position was critical yet again. This time, I played Bh4, of course. But then I inexplicably chose not to play the winning Bg3+. All I can say is that in time trouble sometimes things get confused in my brain. 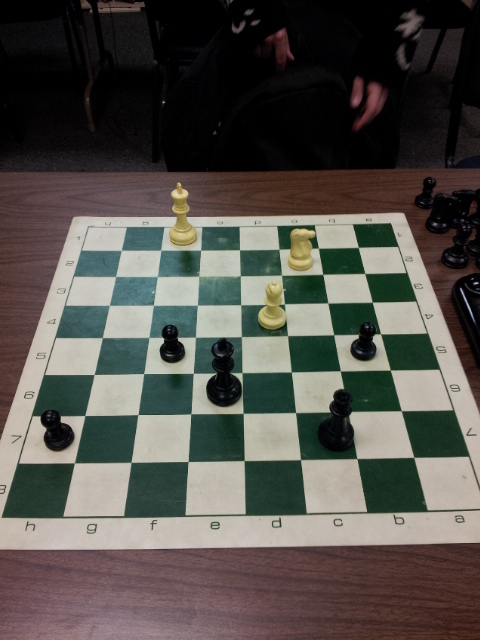 Instead, we entered an endgame that, sadly for Black, is actually quite tenable for White. However, because I had been so obsessed with playing quickly in time trouble, I was ahead on the clock, and my opponent barely had any time to think at all, and in a position like this, the Queen can be very dangerous because of checking possibilities and tactics that might pick up a stray piece. And that’s what happened, as my opponent played blunder after blunder. He hung not only his Rook, but eventually his Knight as well. With hardly any time on the clock left, Melih touched his King reflexively in this position, saw that his Knight was hanging, and resigned. Having a time advantage near the end was helpful. In time trouble, if you don’t see the win, at least don’t blunder into a loss. When short of time, it is advantageous to have the attack and to have active, obviously used weapons such as a Queen and passed Pawns. Anything can happen in time trouble, so setting easy tactical traps (such as forking pieces) is a valid strategy. Remember that most human chess games are really lost, not won; many positions that look bad are, to computers, completely defensible. But in practice, some positions are harder to defend by humans (especially under time pressure) than others. A note on my time trouble issues: these days I have not been playing very well under time trouble, but I remember a period when I was actually pretty good at playing with little time, and won the 2006 Pennsylvania State Game/29 Championship as well as the 2006 Pennsylvania Action Chess Championship with perfect scores. So I think dealing with time constraints is totally a matter of regular practice and training. I used to play 5-minute blitz a lot, and that helped me make practical decisions reflexively with little time. I am too busy these days to hang out at the club and play blitz, so my overall chess competitiveness has suffered as a result. Next week for round 3, I get White again against John Ahlborg, whom I played for the first time also as White a couple of months ago. Now that he knows how I play, I expect he will be prepared against me in some fashion. No worries, I am probably not going to repeat any ideas I’ve posted so far on this blog! I had a tough game in which although I may have had a small advantage during much of it, I did not actually have a won position until near the end, but at that point, time pressure marred both my play and my opponent’s. Finally, as the pieces went flying on the board, he erred worse than I did, and I won.